Chromebooks have become a brilliant replacement for Android tablets, ever since the arrival of Android apps on Chrome OS. 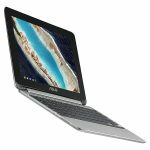 The new ASUS Chromebook C101 doesn’t change much on the surface compared to the original but brings it up to speed in a few key areas. First and foremost, that includes the specifications under the hood. The C101 was to be ASUS’ successor to the much-loved C100. Both are part of ASUS’ so-called “Flip” series, which are convertible touchscreen Chromebooks. The new RockChip RK3399 is a capable chipset for both Android apps and Chrome OS tasks, and we know that because it’s the same one powering the Samsung Chromebook Plus. You’ll also get 4GB of RAM, 16GB of storage (w/microSD), and up to 9 hours of battery life. It flips into tablet mode like the larger C302 model, the resolution remains at 1280 x 800. It weighs less than two pounds making it very handy to use. Much more affordable new Chromebook includes 2 USB-C ports, a single full-size USB 2.0 port, a headphone jack, and the microSD card reader. The Chromebook Flip C101 measures about 0.6 inches thick and weighs about 2 pounds, making it a bit heavy for a tablet, but pretty light for a notebook. We observed that the Chromebook Flip C100 was natural and moving it back and forth to use it as a laptop or tablet made so much convenience for the users. Similarly, the new Chromebook could be used for some light work in laptop orientation, then flip back the screen to read news articles or comic books in tablet mode, something which is very portable to use. Overall, the new Chromebook Flip looks like an excellent offering from ASUS, and the $300 price tag is exactly how much we want it to be. Pre-orders are open now through Amazon, but a release date isn’t available yet.